SPOILER WARNING; it is assumed you have played the game before reading this page. Mai Hasegawa, code-named Konoko, is the protagonist controlled by the player in the 2001 third-person action game Oni. She has black hair with purple highlights, and stands about five and a half feet tall. Her age is not given in the game's material. She works as a TCTF agent, a police officer who fights technological crime. She is one of only two prime Daodan symbiotes, giving her considerable strength and stamina. Bio Data: Orphaned at the age of 3, the woman now code-named Konoko has been raised as a ward of the World Coalition government ever since. Her upbringing has been overseen by a legion of scientists and TCTF personnel, and she has been trained in the most advanced combat and counter-terrorism techniques. Strengths: Master of hand-to-hand combat, expert marksman. Weaknesses: Emotional attachment to the Shinatama SLD. Description: Konoko has been raised by the TCTF for as long as she can remember. She knows that she is somehow "different" from other people, but she is anxious to prove herself to Commander Griffin and the rest of the TCTF. Mai's mother Jamie died while Mai was very young, perhaps while she was still an infant. As the manual indicates, Mai was then separated from her father at the age of 3. Because she did not think about her parents for so long, she seems to have forgotten about any life before she was brought to the TCTF. When she was 7, the TCTF implanted in her a prototype Daodan Chrysalis developed by her father. Although this was done without her knowledge, as mentioned in the manual, she knows she is different from others somehow. 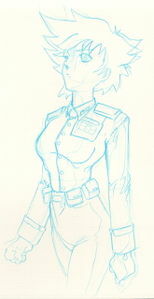 At the start of Oni, Konoko was working under the orders of Commander Griffin. She received mission data from Shinatama, an SLD, and her Chrysalis' development was monitored by the SLD as well as the scientists working for the TCTF, including Doctor Kerr. However, she had not been assigned any missions before the events of Oni. After completing her training, Konoko was assigned her first mission: a rendezvous with an undercover TCTF operative working in a Syndicate warehouse. Upon discovering the agent's dead body, she found a datapad linking the warehouse to the Musashi Heavy Manufacturing Concern, a suspected Syndicate front. Following the lead on Musashi, Konoko led a team to investigate the company, but were quickly ambushed by Syndicate forces. While Konoko and her team were trapped within the building, Syndicate forces, under the command of Barabas, attacked a nearby research facility. Upon reaching the research facility, Konoko had her first battle with Barabas; however he and his boss, Muro, escaped. 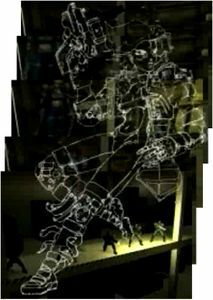 Konoko pursued Muro to the Vansam Regional Airport, during which time Muro found out about Konoko's neural link to Shinatama, and sent Barabas to abduct Shinatama from the TCTF Regional HQ. Konoko managed to enter the TCTF Regional HQ as it fell under attack from Syndicate forces. Despite gaining assistance from the besieged TCTF personnel still alive after the attack, Konoko was unable to stop Barabas from capturing Shinatama, and fought him for a second time on the roof of the HQ, as Shinatama was carried away in a Syndicate helicopter. When Shinatama is kidnapped from the TCTF HQ, Konoko decided to rescue Shinatama personally. Griffin, on the other hand, opposed her decision, stating that he had already sent a strike team to retrieve Shinatama. In spite of this, Konoko disobeyed his orders, and went to the Atmospheric Processor where Muro had taken Shinatama. While Konoko was able to reach Shinatama, she had been badly damaged by Muro. It was at this time that Konoko learned from Shinatama that her actual name was Mai Hasegawa, and that the SLD had been constructed to monitor the development of a "Chrysalis" inside her. Griffin, fearful of Konoko's unbridled development as a symbiote, ordered Shinatama's self-detonation in order to kill Konoko. After escaping from the blast, Konoko was declared a rogue agent by Griffin. Konoko next went to the Regional State Building in order to gather information about her past, but the data was stolen by the ninja Mukade right before she could obtain it. Konoko pursued Mukade through the nearby rooftops before cornering him and recovering the disc. When reading the contents of the disc, Konoko learned of her parents, particularly her mother Jamie Hasegawa -- maiden name Kerr, thus making Doctor Kerr her uncle. Upon locating Kerr in a prison-like TCTF facility, he informed her about the nature of the Chrysalis and revealed that her brother was Muro. Shortly after this, Kerr gave his life to save Konoko's. Looking for revenge, Konoko infiltrated TCTF Regional HQ and confronted Griffin, with the player choosing whether to kill him or spare him. She then traveled to Muro's Mountain Compound to determine what his plan was, and to stop it. Learning that he was about to send a signal for the world's ACCs to reverse their air-cleansing process, she could only think of one alternative: to sabotage the signal. Shortly after Konoko defeated Muro in combat, the ACCs received the faulty signal, and many of them were destroyed. At the end of Oni, the casualties are beginning to mount from the polluted air making its way into the cities, but Konoko looks forward to the use of her father's work, the Chrysalis, to save mankind from the crisis. CHAPTER 08 . AN INNOCENT LIFE is where Konoko first learns her real name. It is spoken by Shinatama, but at that moment Konoko may not be able to absorb much of what Shinatama tells her. CHAPTER 11 . DREAM DIVER is where Konoko learns most of the information about her parents, Jamie Kerr and Professor Hasegawa. She and her brother Muro are not referred to at all in Hasegawa's diary, except for the newspaper article GRAD STUDENT DIES : MURDER OR MERCY: "Jamie Kerr Hasegawa, environmental activist, top grad student, mother of two". Konoko is referred to as "Hasegawa, Mai" in a console there. The readout relates mostly to experiments performed on Mai at some point in time. After scanning Mai, Kerr discloses that Muro, Mai's enemy, is indeed her brother. He does not, however, make any statement as to Hasegawa's fate or whereabouts, nor does Muro in their final confrontation. "Kono" means "this" in Japanese, and "ko" means child (or "great", "price", or "sin"!) (source). Hence, "Konoko" literally can mean "this child" to a Japanese speaker, and is often used in this manner. Although we don't know who in the TCTF would have given this code name to her, her father was Japanese. Also, the TCTF Regional HQ seems to be in Japan, and Shinatama also has a Japanese name. Despite any "added value" we assign to Konoko's name, Brent Pease admitted HERE that he had no meaning in mind when he created the name. According to ( http://www.behindthename.com/php/search.php?terms=mai&nmd=n&gender=both&operator=or ), Konoko's true name translates as 'dance' or 'linen robe'; most commonly, "mai" is used in everyday Japanese with the meaning "dance". Here are the outfits in order by Chapter, with rationales given in the Commentary. The dates are taken from Konoko's diary unless they are followed by a question mark. The Interval column helps illustrate the reason for a change or no change in outfit from the previous Chapter. 0 TCTF Training before Oni N/A Konoko prepares for training in what will be her standard outfit for missions (and 7 out of 15 levels in Oni). 1 Syndicate Warehouse 11/22 ??? We shouldn't assume that Konoko finished her basic training and was immediately assigned to a mission, so we don't know how much time has elapsed since Ch. 0. 2 Musashi Manufacturing 11/22 immediate Konoko speeds on her bike from the Warehouse to Musashi. While doing so, her outfit magically changes to a police uniform sans armor, then reverts back to her armored outfit next Chapter! 3 Vago Biotech 11/22 immediate Realizing that Musashi was a wild goose chase, she then speeds on her bike to face Barabas at Vago, apparently changing back to her armor while driving! 4 Vansam Airport (Terminal) 11/22 immediate Konoko then immediately tails Muro's van to the airport. 5 Vansam Airport (Cargo Hangars) 11/22 immediate A continuation of the previous level. 6 TCTF Regional HQ 11/24 two days It's not surprising that Konoko is now dressed more casually, as a couple days have elapsed and she is not on a mission when the level begins. 7 ACC (Exterior) 11/24 hours That same day, Konoko equips herself for a rescue mission by putting on her battle armor and getting her glider, and sets out without permission to find Shinatama. 8 ACC (Interior) 11/24 immediate A continuation of the previous level. 9 Regional State 11/26 two days Konoko is no longer a TCTF agent, so from this point on she wears functional civilian clothes. 10 Rooftops 11/26 immediate A continuation of the previous level. 11 Hasegawa's Lab 11/28 two days We can infer the date 11/28 from the diary entry dated 11/29 which makes a note not to eat pizza before bed, referring to the previous night's bad dream in Chapter 11. 12 TCTF Science Prison 11/30? two days? This level probably takes place at least one day after the 11/29 pizza entry, or else she would have mentioned in that entry that she is storming a high-security TCTF compound. Konoko has interchangeably worn this jacket and these pants a few times by now, but they will not appear again after this level, as they were lost in the "acid bath". 13 TCTF Regional HQ 12/1? one day? Konoko probably needs at least a day after her ordeal at Science Prison to regroup and make this raid on her old HQ. The jacket is the same one worn in Ch. 9 and 10, so presumably she has somewhere to store things like clothing and equipment since going rogue from the TCTF. 14 Syndicate Mountain Compound 12/3 two days? We know the date for this level but not how long it's been since Ch. 13. Here Konoko wears a surprisingly casual outfit for a one-woman assault on the bad guy's stronghold (and jeans aren't easy to kick in!). But with her Chrysalis advancing, it doesn't seem to matter what she wears. 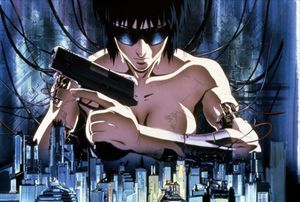 Even though Oni was inspired by Ghost in the Shell, Konoko seems to have been envisioned from the beginning as an aggressive, "gun in your face" action hero, unlike the impassive Motoko. An early story for the game explained Konoko's mindset this way: "Konoko vows to destroy the Syndicate that killed her parents." Over the course of the story, she feels more "betrayed", "guilty", angry and "paranoid" until she finally kills essentially everyone in the game. By contrast, the final game's Konoko is still emotional, but is also mostly in control of herself, even choosing to spare Griffin, if the player wishes. She also makes wisecracks while under pressure. Instead of a violent ending driven by her paranoia and need for revenge, we have an emotionally ambiguous ending where Konoko stops Muro's plan with a desperate, destructive action, without showing much of her feelings. One hint at the earlier, unstable Konoko is found in her deranged look in the intro. Konoko was also stated in this development data to have an IQ of 203. While a high IQ is not mentioned in the final game, her behavior at times indicates that she is still very intelligent. See HERE for a more detailed discussion of Early Konoko. A lost image which has been reconstructed from the 1998 trailer. 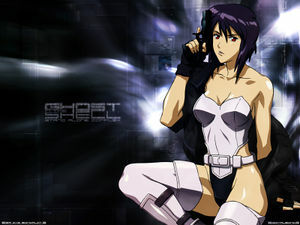 Vaguely reminiscent of some of the sexier representations of Motoko (as on right). The cropped image that is part of the left montage and is labeled "Alex Okita's" is not in our possession. The style is quite different from Okita's other drawings, but it's not the only work of his which varies in style from the others. Also, the design of the glove matches the Okita character sheet on the right, which is part of a series with the two below this. These images may have been provided to AIC for animating the intro and outro. The first outfit is very similar to the one in the intro, and the second outfit is worn in the outro. Looking more familiar. The Konoko on the left has a similar face and hairstyle to the model in the 1998 trailer. The one on the right is wearing the police uniform from Chapter 2. "Shirow" is Ghost in the Shell's author, Masamune Shirow. 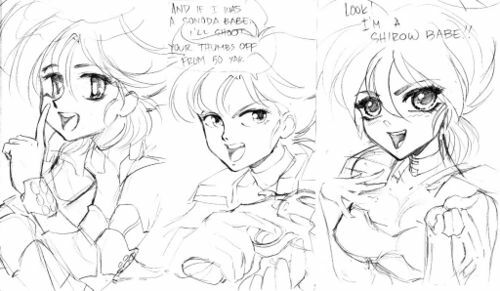 Lorraine produced the sketches of Konoko on the right to show her mastery of various animé styles. 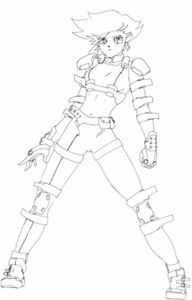 While she was made the art director of marketing in June 1999, Okita's designs for Konoko were already well in use by that point (for instance, the Konoko in the intro is Okita's design). The in-game model also appears to be based on Okita's art rather than Lorraine's, which is not surprising when one considers that Okita was one of the 3D modeling artists. ↑ This Unit Viewer image gives her height as 5'5", though it comes from early in the story's development. ↑ Konoko's height was estimated at 5'6" using world units here. ↑ However, this biographical info from an earlier story draft gives her age as 23. ↑ Konoko's age at implantation is mentioned here. This page was last edited on 19 May 2017, at 21:58.